Today, we awoke on the Ides of March to news of a coordinated media blitz from Google Analytics as they executed a dramatic product launch – rebranding several of its enterprise-class products and announcing new products that are on their way, if not quite here yet. These new products address specific limitations that Google Analytics-critics have decried for years: content experiments, data visualization, and managing large amounts of data. The new tools boast features that Google Analytics is well suited to handle – products working seamlessly together in the Google ecosystem to provide holistic solutions for marketers and analysts. To make this all work together in the 360 Suite, we see some of our old favorites being renamed. GA says that current customers of these items will see the changes rolling out in the coming months. Google Analytics 360, the enterprise-level version of Google Analytics, is now called Google Analytics 360. Google Analytics 360 will still have all of the same accoutrements of GA360, more features, more integrations, more features, and less sampling. You can read more about these differences here. Adometry, the advanced attribution company that Google Analytics acquired in 2014 is now called Google Attribution 360. This tool helps to go beyond the attribution tools that come baked into Google Analytics 360 and bring in outside information like views, click-throughs, and TV analysis. This, along with the other 360 products, will remain separate products that can be added à la carte into the suite. Along with renaming its existing products, Google Analytics formally announced the launch of several features that have been years in-the-making, whispered about in hallways and Google office nooks, and are finally making their appearance into the world. These products will directly challenge existing products on the market and will help to round out the suite to truly meet the needs of enterprise-level marketing and analytics. These new products are all currently in limited beta, and Google Analytics has said it will reach out to current Google Analytics 360 customers when they’re eligible to join. Similar to Google Analytics, which has a free version that anyone can use, Google Tag Manager is spinning off a premium version that is called Google Tag Manager 360. This will plug neatly into the suite and will supposedly offer a few ways to differentiate itself from its free counterpart. Google Analytics 360 took a period of time to really bulk up its offerings, so we can expect GTM 360 to grow over the next couple years. Google Tag Manager, both the free version and the 360 version, helps make it easy to tag your website to collect information about users and their interactions on your site, whether you’re using Google Analytics tags, third-party tags, or custom tags. Now we’re talking! Google Analytics is launching a revamped way to run content experiments on your website. You’ll be able to test and personalize multiple variations and track the version that performs best and should connect seamlessly with Google Analytics 360 and Google Tag Manager 360. Optimize will also tie in directly with the Audience Center 360 tool below, as well as DoubleClick and AdWords to link to campaigns and measuring success. With these connections, your experiments and tests will go beyond the standard A/B tests. As technology bounds every year, the amount of data we have to work with is exploding. Google’s Audience Center 360 is a “powerful data management platform” to help connect with Google Analytics 360 with DoubleClick, third party data, and more. We’re looking forward to getting all of our audience data together into one place, and being able to connect different data sources together to better target customers with testing, advertising, and getting better insights. This is the one that our data science team is geeking out over! This new tool offers ways to visualize and analyze all of your new data into “beautiful, interactive reports.” This also includes real-time collaboration and sharing, which we’re also thrilled about. This brings together all of the data from the suite, can link together outside data, and then can help display the information in meaningful ways to help you make more data-based decisions. This product comes in two flavors – there’s a free version that anyone (in certain countries) can use, with five free reports, and then there’s the full enterprise version, Data Studio 360. Want to learn more? Check out our post about Google Data Studio! So we’ve got old products with new names and new products rolling out in the next couple months. Already, we’ve started getting questions about how this impacts current customers! If you’re currently a Google Analytics 360 customer, you are primed to take advantage of these new tools as they become available. Google Analytics has said you’ll encounter the new names rolling out shortly. As access becomes available to the limited betas for the new products, current customers will be made aware and ideally invited to participate, though I’m sure these will be limited. Remember, these are new products that are being sold. 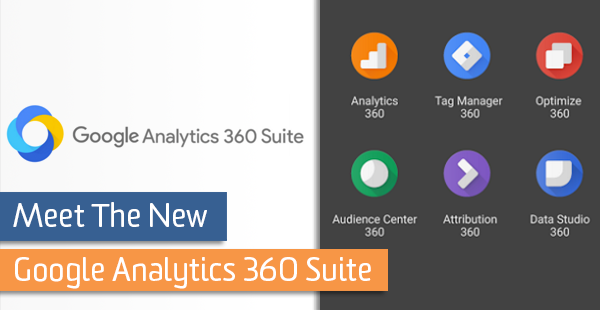 Current Google Analytics 360 customers will also get Google Tag Manager 360 as part of their license, but the other announced products will need to be added on as needed. If you’re currently using the free version of Google Analytics, then you’re really not going to see many changes. These new products and features are a separate, paid tier of products, though certain products will be able to be purchased independently from each other. If you’ve been questioning whether or not Google Analytics 360 is right for you – this announcement of upcoming launches should help show you the path that Google Analytics is heading, connecting marketing and analytics to increase your understanding of customers through smart integrations and intelligent tools. We’ve got more information about Google Analytics 360 here, and we’re always available to chat! If you’re not currently using Google Analytics, it’s time to start comparing features! These tools are designed to work seamlessly together, as well as providing the ability to bring in data from third-party products and internal products. 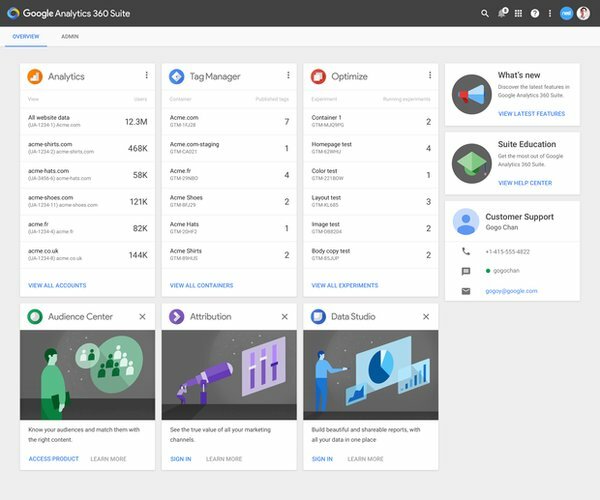 The Google Analytics 360 Suite helps to connect your marketing, website interactions, online and offline data, and to help you turn all of that data into decisions. We’d love to tell you more about these Google Analytics 360 and these additional tools!